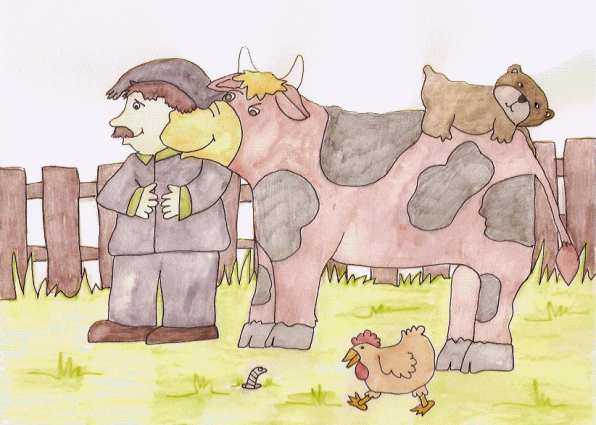 One fine morning, Farmer Albert went to the barn to milk his favorite cow, Jenny. Much to his delight, Jenny filled a bucket to the brim with creamy white milk. Farmer Albert took it back to the house for his family. He then went to gather the eggs from the chicken coop. Farmer Albert loved fresh eggs and so did his wife, Anna. She made omelets with onions, ham and cheese and Farmer Albert devoured them hungrily. After he'd finished gathering eggs, he grabbed a bale of hay and went to feed his bull, Willie. Willie stayed in a field of tall grass and nibbled all day, but when Farmer Albert brought him hay, he'd buck and ran around, happy as could be. This day Farmer Albert found Willie sitting in the grass. He wasn't happy at all. He didn't run around and buck, but sat with a frown. Farmer Albert took the hay right up to him, petted the bull's cheeks and sang him a song. “Willie, the bull, is the best around. No other bull like him can be found. Even the song didn't cheer Willie up. Farmer Albert shrugged his shoulders. “It won't hurt to try.” He took the teddy bear into the field. “Look what I brought you, Willie. It's a friend. His name is Buster. He's all yours.” Farmer Albert put the teddy on Willie's back. Willie turned his head and looked at the teddy bear. A smile spread across his face. He stood and munched on the hay. When he finished he ran around the field and bucked, making sure the bear didn't fall off. Jenny gave a loud moo. Farmer Albert hugged his teddy and put it on his bed. Never again were any of the animals, or people, at Farmer Albert's farm lonely again.